Shirley Valentine is the first show of the Jungle Theater's 2011 season. I've attended several shows at the Jungle over the past few years, but this is the first year I have a season pass. They always do good work and it's such a lovely little intimate space, and there were several shows in this year's season that I was interested in. But Shirley Valentine was not one of them; I knew nothing about this show before I went to see it. It ended up being great fun, and also poignant at times. Shirley Valentine is a one-woman show about a woman in Liverpool who is stuck in her life, and begins taking steps to change it. For this production, that woman is the very talented Cheryl Willis. She completely inhabits this character and is totally comfortable in her skin. In the first half of the first act, Shirley is cooking supper for her husband: chips and egg. I was fascinated by the real preparations, from peeling and cutting the potatoes, to frying an egg, to heating up a can of gravy, to assembling all on the plate and putting it on the table. It all seems second nature as her hands do the work while she tells her story. She talks directly the audience, and occasional asks the wall for reassurance, "Isn't that right, wall?" Shirley is a woman stuck in the routine of her life. Her children are grown and have left home, her husband has become cruel and demanding, she only has one friend to talk too. So when that friend plans a trip to Greece for the two of them, Shirley is at once thrilled by and frightened by the idea. She can't possibly go to Greece for a fortnight, can she? Of course she does, without telling her husband! The second act takes place in Greece, and it's a different Shirley we see. She's more confident, more relaxed, more alive. Shirley has seen the life that exists beyond her narrow world, and is forever changed by it. 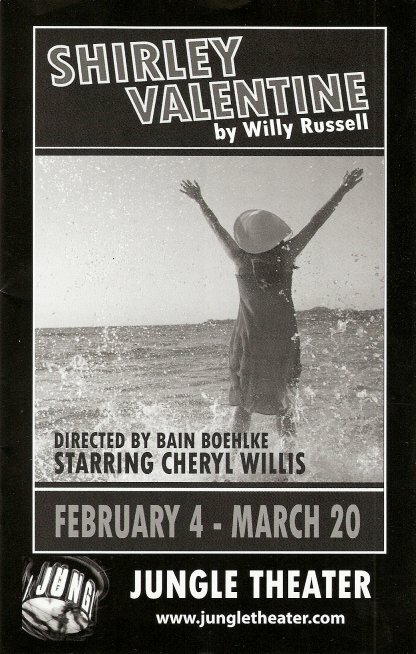 i loved the movie shirley valentine, and i'd always wanted to see the show. i'm glad you got to see it. i'd love to see the movie, i'll have to ask tivo.